Squirrels are cute little creatures. They scamper around yards and gardens and parks, up trees and through bushes. Some people find them to be pests but most people won't deny their adorableness. 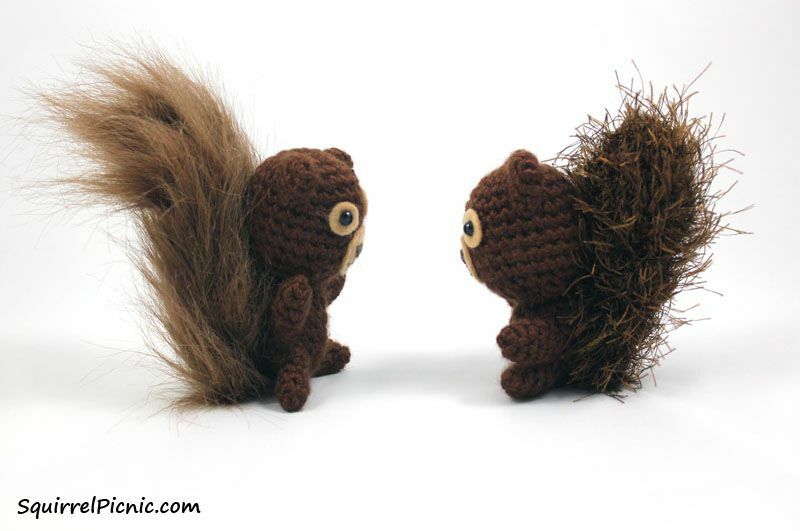 Crochet squirrels have all the cuteness (and then some) without any of the "pest". Here are nine free squirrel crochet patterns to fill your life with adorable energy. Unsurprisingly, the very best resource for squirrel crochet patterns is Squirrel Picnic. In fact, Squirrel Picnic has a crochet book called The Big Acorn Race that tells a squirrel story while sharing crochet squirrel patterns. Author and designer Jennifer does also offer us this free crochet squirrel pattern on her blog, though, and it's a great place to start if you are new to crafting squirrels! Once you start to look at a variety of different crochet squirrel patterns, you realize that there are all of these subtle differences that make each one look different than the last. It could be a lot of fun to make a whole set of crochet squirrels to help you decide which you like best - or just to have an excuse to crochet a lot of squirrels! This free crochet pattern is by Tamitha. Claire Houck created this free crochet squirrel pattern in a larger size that resembles a more traditional stuffed animal. It's a grey crochet squirrel pattern that is offered as a free pattern download on Ravelry. Crochet designer NyanPon says that white squirrels do exist in the wild, even if you don't see them very often. This one sure is cute. And with those pink eyes, it makes a great little stuffed animal gift for Valentine's Day! Precious. People who prefer their "cute" with a little bit of edge can enjoy this free crochet pattern by Genuine Mudpie, who has turned a simple crochet squirrel into a ninja! Fans of the Ice Age movie will be familiar with Scrat the Squirrel. This free amigurumi crochet pattern is inspired by that character. It's a free crochet pattern from Great Grey Crochet. And even if you don't know the movie, it's a great choice for a crochet squirrel pattern with a cartoon look to it. Dress up your mobile devices with cute crochet cozies. This crochet squirrel phone cozy is one option for doing that and a super cute one at that. This free crochet pattern is a Ravelry download by Akkina Stisu. Never lose your keys again when you've got this squirrel friend to help you keep track of them. This is an amigurumi-style free crochet pattern by The Sun and The Turtle. This is inspired by the Marvel character Squirrel Girl. It was originally part of a Geek-a-long for crocheters and knitters. There are versions of the square in both crafts offered as free crochet patterns.